Of all the musical instruments in jazz music it's fair to say the violin has gone the short end of the bow. Samuel Savoir-faire" Williams wants to change the way African Americans view the instrument and our history with it. Tell me about African Americans' historical relationship with the violin and how you are making sure the violin secures its place in jazz history? I think, with respect to Jazz, that there is a very rich history in the tradition of American folk music. ... African Americans have been playing violin since we were first brought over here. One of the things that has been missing is the documentation of these great African American violinists. There is a direct linkage and connection between me and what I am trying to get out codifying the sound of the vocabulary on it. What do you mean when you say codify"? To me, the history of Jazz has very important points where you can say there was a turning point in the evolution of the music. One thing that is missing is those pivotal points in the history of the music with respects to the violin. Tell me about the East Side Project Band? At first, it was a naïve concept. At the time, I felt like I needed to have something unique to say and I wanted to make a full-time living, and if I put ;project; on the name I thought maybe it would get more attention because it was 'a project.' 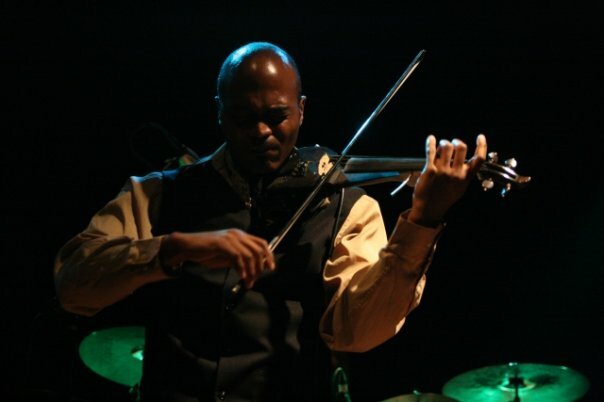 It was really a concept to produce a working band with a professional Jazz sound that I could be the leader of as a violinist to actually help artists get full-time work in performing and over the years a lot of Jazz musicians that have come through my band have gone on to professional work. Jazz trumpeter Wynton Marsalis critiqued your work and offered some professional advice several years ago. What became of it? He said, 'if you really want to play Jazz, then you need to study with a jazz violinist.' And he told me to look up Johnny Frigo. I found out who he was and I asked if I could take lessons from him and the rest is history. Mr. Marsalis walked me out of his hotel, shook my hand and said, 'if you are really serious I'll see you in the future."